I don't know if this happened to you, but my entry two days ago about pizza got me so reinvigorated about pizza, that I couldn't help but outdo myself on Labor Day and make pizza for me, Julia, Hill (my sister) and Chris (her husband). I used as many of my own tips as possible, but also got adventurous and made my own pizza dough with a couple dough recipes I found on the Internet. With help from Julia, my pastry aficionado, of course. I also made my famous panzanella (bread salad) to go with. I think everyone enjoyed the offerings very much. So much so that we didn't even miss the more traditional Labor Day grill that we skipped this year. PIZZA A: The first pizza was a white crust in a typical margarita style with tomatoes sliced thinly and de-seeded, a thin layer of fresh mozzarella, chopped basil and the tiniest drizzle of extra virgin olive oil. The dough came out great, very light and crispy. Here is the recipe for the white dough, which I followed as it is written. When it was done and rolled out until thin, I molded the dough into a circle on a lightly oiled flat pizza sheet. I pinched up the crust on the sides to give it a little height and to pull a little extra dough back onto the pan. After topping it, I baked it at 425 degrees for 17 minutes, and the crust came out golden and the cheese came out melted and slightly browned. I let it cool for 10 minutes, sliced it into 8 and served to a delighted crowd. It was a very nice light pizza that I don't often taste in restaurants, so I was pretty pleased with my work. 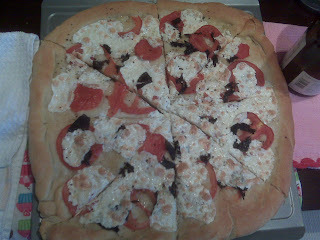 PIZZA B: Meanwhile, while I was making the white dough and the first pizza, I was also making a whole wheat dough and a second pizza. I chopped up some baby portabella mushrooms and some oyster mushrooms and tossed them in a little bit of extra virgin olive oil and pepper for later. For the crust, I followed this whole wheat dough recipe, but found the dough needed at least half a cup extra flour in the kneading stages to make it come together and un-stick. I rolled out and formed the dough exactly as I did with the first pizza. To top it, I put a thin layer of jarred marinara sauce, followed by two-thirds of the mushrooms, a layer of shredded cheddar and finally, topped it with the last third of chopped mushrooms. I cooked this wild mushroom pizza for 17 minutes on 425 degrees as well, and it came out just as golden and perfect as the margarita. 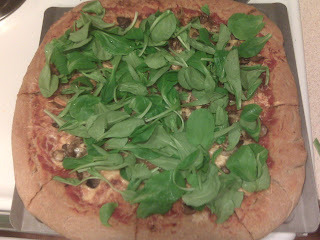 After I sliced the pizza, I topped it with a generous amount of arugula to add that extra layer of tangy, crispy and cool to the second pizza. This may have been more of a hit than with the first pizza, with people unexpectedly surprised by the moist texture of the whole wheat crust and the great addition the arugula was to the overall taste. And let me remind you, neither of these pizzas had anywhere close to as much fat, oil, sugar or salt as most pizzas that are delivered or served. Start checking out nutrition facts on these, and you'll quickly want to be making your own pizzas as well. PANZANELLA: This Italian bread salad is a specialty of mine. I only had it once or twice before I started making it, really with little idea whether my version is authentic or not. But whether it is or not, it is a real crowd pleaser every time I make it, and not to be let down, this crowd licked the (salad) bowl clean. So this is how I make mine. I chop about half a tomato for each person, and an eighth of a red onion per person. I then dice a small loaf of good whole wheat bread (not too dense though), or a third to half of a large loaf. I drizzle enough EVOO over the bread to get most of the pieces a little saturated after I mix them up, and I add a pinch of salt and lots of pepper. Then, with just a little more EVOO in a hot pan, throw in the bread and just sauté the cubes until they're toasted. When done, take the bread cubes out and put them in your salad bowl. Add the tomatoes and onions on top and add about 1.5-2 tablespoons of white wine vinegar, a little more salt and a lot more pepper, and mix them up. Then, preferably soon, when you're ready to serve, add a big bunch of dark greens (like arugula in this case) and toss it with the now-dressed tomatoes, onions and bread. The croutons are magnificent, with their slight crunch and slight chewiness, going perfectly with the onions and vinegar. I can't think of a person for whom this salad would not elicit a smile. And foods like these that make us smile are definitely worth making, serving and eating just about any time.